A former Nazi collaborator who served as a labour-camp guard in World War Two has died in Germany aged 95, local media report. 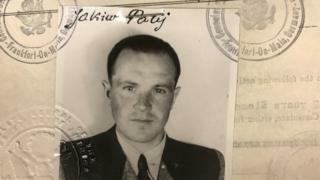 Jakiw Palij, who was thought to be the last Nazi collaborator living in the US, was deported to Germany last year after a lengthy legal battle. Palij had been stateless since 2003 when a federal judge revoked his US citizenship over his Nazi links. Reports say he died in a home for the elderly in the town of Ahlen. Before his deportation, the former guard lived in the Queens borough of New York City. His presence there, in a particularly diverse borough, became a point of contention when his past emerged. His home was often picketed by protestors demanding his expulsion. Palij's deportation case was resolved last year when Germany agreed to take him in - despite him not possessing German citizenship. In August, the 95-year-old was taken from his home in a wheelchair and flown to Düsseldorf. At the time Richard Grenell, the US ambassador to Germany, praised President Trump's leadership in helping to resolve the protracted legal dispute. Palij is believed to have been born in 1923, in an area of Poland that is now in Ukraine. US authorities alleged he was trained in 1941 by Nazis to work at Trawniki - a camp in German-occupied Poland. The camp initially served as a holding centre for refugees and Soviet prisoners of war, but was eventually transformed by the SS into a training facility. The thousands who trained there became known as Trawniki men - tasked with rounding up Jewish civilians from Poland and staffing killing centres at Sobibor, Treblinka and Belzec. It also housed a forced labour camp where thousands of Jews died - including 6,000 who were killed in a single day in 1943. US authorities accused Palij of being an armed guard at Trawniki, and said he played an "indispensible role" in ensuring Jews were killed. Palij himself denied collaborating with the Nazis - telling the New York Times in 2003 he worked for them in fear for his own family's safety. He also denied having ever set foot in a camp himself. A US court ruled he had assisted in the persecution of prisoners, but did not find him personally responsible for deaths. The former guard entered the US through Boston in 1949, allegedly under a law meant to help refugees fleeing post-war Europe, the Associated Press report. He was eventually granted US citizenship in 1957, and held it until his past came to light decades later. In 2004 he was ordered to leave the country - but ambiguity over his citizenship delayed deportation. For 14 years US authorities could not persuade Germany, Ukraine or Poland to take him in. But last year, it was announced the German position had changed. He was given a residency permit using a technicality decree intended for humanitarian or political purposes, German media report. However, after Palij's arrival, German officials cast doubt he would ever face prosecution over alleged war crimes - citing lack of evidence.